Vivian Patrick Campbell (born 25 August 1962) is a Northern Irish rock guitarist. He came to prominence in the early 1980s as a member of Dio, and has been a member of Def Leppard since 1992 (replacing Steve Clark). Campbell has also worked with Thin Lizzy, Whitesnake, Sweet Savage, Trinity, Riverdogs, and Shadow King. Campbell began playing guitar at the age of 12 with a Telecaster Thinline and Carlsbro Stingray amp. When he was 15, Campbell joined Teaser, which went on to become Sweet Savage, a NWOBHM band. In 1981 they released an EP consisting of four BBC radio sessions and their first single, "Take No Prisoners". The band's song "Killing Time" was later covered by Metallica as a B-side for their "The Unforgiven" single, and was included on Metallica's Garage Inc. covers album. Campbell left Sweet Savage in early 1983 to join Dio after guitarist Jake E. Lee was offered Randy Rhoads's spot as Ozzy Osbourne's lead guitarist in December 1982. When Campbell joined Dio, Ronnie James Dio, Vinny Appice, and former Rainbow bassist Jimmy Bain had most of the songs to the album Holy Diver already written. The album was a success and included Dio's biggest hit, "Rainbow in the Dark". A concert video, called In Concert, from this tour was released. The band also played at The 4th Monsters of Rock festival at Castle Donington, England in August 1983 and Monsters of Rock, Nurnburg, Germany in 1984. Dio returned to the studio to write and record the follow-up to Holy Diver. This album was called The Last in Line and charted at No. 23 in the US. "The Last in Line", "We Rock" and "Mystery" all became radio hits. A concert video from this tour called A Special From The Spectrum was released. The follow-up Sacred Heart was also a success, and managed to peak at No. 29 in the U.S. It featured the hits "Rock N Roll Children" and "Hungry For Heaven", the second of which was also included on the soundtrack to the film Vision Quest. Also around this time the band recorded the song "Hide in the Rainbow" for the Iron Eagle soundtrack, the last song Campbell would record with Dio. A live EP Intermission was also released. Craig Goldy played on the disc's only studio song "Time to Burn" and over-dubbed the rhythm parts on the live tracks. Campbell and the band parted company in 1986 and he joined Whitesnake. He was replaced by Goldy. However, Campbell had a feud with Dio. In 2003, Campbell said "[Playing in Dio] never mattered to me – and still doesn't… He's an incredible talent, but he's an awful businessman and way more importantly, one of the vilest people in the industry." Campbell later stated that he regretted making this statement. Despite this, Dio stated in an article in Hit Parader that he wished Campbell "the best." In 1987, Campbell joined the British hard rock band Whitesnake. Ex-Thin Lizzy and Tygers of Pan Tang guitarist John Sykes wrote and played the lead and rhythm parts on the multiplatinum-selling album simply titled Whitesnake but was fired by the band's leader, David Coverdale, after recording was completed. Campbell was recruited to replace Sykes in the new, glammed-up Whitesnake Coverdale had put together to conquer MTV and American audiences; other members included Adrian Vandenberg, formerly of Teaser and Vandenberg, Tommy Aldridge of Ozzy Osbourne and Black Oak Arkansas fame, and Rudy Sarzo, who had become hugely successful playing with Ozzy Osbourne and Quiet Riot. While he didn't record an album, he replaced John Sykes' guitar solo on the "Give Me All Your Love" 1988 single remix. Campbell was fired from Whitesnake after the band's 1987–1988 world tour. After leaving Whitesnake, Campbell would go on to play on Lou Gramm's second solo album, Long Hard Look. Though Gramm toured in support of the album, Campbell would not join him. Now a free agent in the business, Campbell joined the group Riverdogs after being tapped to produce their first demo. As an official member of the band, he would contribute to their eponymous debut album in 1990. Campbell once again teamed up with Lou Gramm in 1991 to join Gramm's new band Shadow King. After a single eponymous album, one music video, and one live show, Campbell left the group to join Def Leppard. Shadow King soon disbanded following Campbell's departure as Gramm and bassist Bruce Turgon would return to Gramm's former band Foreigner. In 1992, Campbell joined the rock band Def Leppard, after the release of their Adrenalize album. He replaced Steve Clark, who died on 8 January 1991. According to fellow guitarist Phil Collen, Campbell was able to lock right into the position very naturally by simply being himself. Campbell made his debut with the band by playing a show in a Dublin club to approximately 600 people. A week later, 20 April 1992, the band took the stage at the Freddie Mercury Tribute Concert, with their new guitarist. They performed, "Animal", "Let's Get Rocked", and the Queen classic, "Now I'm Here", with Brian May. Despite treatment for Hodgkin's lymphoma, Campbell continued to tour with Def Leppard during summer 2013, and he and the rest of the band have returned to the stage in summer 2014 as co-headliners with Kiss. In 2005 Campbell released a solo album produced by Tor Hyams called Two Sides of If, which features cover versions of his favourite blues tunes and one original blues song. Terry Bozzio plays drums on the album. ZZ Top's Billy Gibbons guests on two songs, and Joan Osborne on one other song. In mid-2010/early 2011, when Def Leppard was on hiatus, Campbell agreed to join Thin Lizzy, long his favorite band. After the tour, which he said inspired him to play more aggressively, he asked Jimmy Bain and Vinny Appice to get together. With singer Andrew Freeman they recorded Heavy Crown. Bain died before the album was released, and Campbell praised his creativity and his presence, adding that Bain deserved co-writing credits on more of the early Dio songs. Campbell currently lives in Southern California and has two daughters with ex-wife Julie Campbell. After getting divorced, Campbell married his longtime girlfriend Caitlin Phaneuf on 4 July 2014. He also plays football regularly with Hollywood United F.C., a team composed mostly of celebrities and former professional football players. On 10 June 2013 Campbell revealed that he has Hodgkin's lymphoma. Though he announced in November 2013 that he was in partial remission, in June 2014 he took that back saying the statement was premature. He had stem-cell therapy in late 2014, and by October 2015 he announced that while the cancer is still there he was doing much better using immunotherapy, undergoing treatment every three weeks with pembrolizumab. Vixen – Vixen (1988); acoustic guitar on "Desperate"
Steel Panther – All You Can Eat (2014); guitar solo on: "Gangbang at the old folks home"
^ "Dio Biography". Retrieved 9 January 2009. ^ "Vivian Campbell Biography". Viviancampbell.com. Retrieved 9 January 2009. ^ "The 26 Best Rock Feuds Ever!". Metalhammer.co.uk. Archived from the original on 12 June 2011. Retrieved 18 July 2011. ^ "Vivian Campbell vs. Ronnie James Dio – Nastiest Rock Feuds". Ultimateclassicrock.com. Retrieved 1 August 2014. ^ a b Elavksy, Cindy (23 June 2013). "Celebrity Extra". Downriver Sunday Times. King Features. Retrieved 5 September 2013. ^ a b Prato, Greg (October 2016). "Vivian Campbell: Back in Line". Vintage Guitar. p. 24. ^ "Def Leppard's Vivian Campbell Marries Longtime Girlfriend Caitlin Phaneuf". Blabbermouth.net. 6 July 2014. Retrieved 24 January 2016. 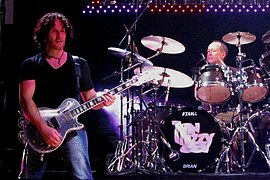 ^ "Def Leppard's Vivian Campbell battling cancer again". Toronto Sun. 25 June 2014. Retrieved 27 June 2014.